Each Welcome Mat features a sturdy rubber backing and a pink ribbon to remind people of the cause it supports. All welcome mats measure 2' by 3'. The mats are stain and water resistant, machine washable, made in the USA, and can be used indoor or outdoor. I like these mats around many areas in our home. These mats not only support a good cause, but also meet different personal style statements. 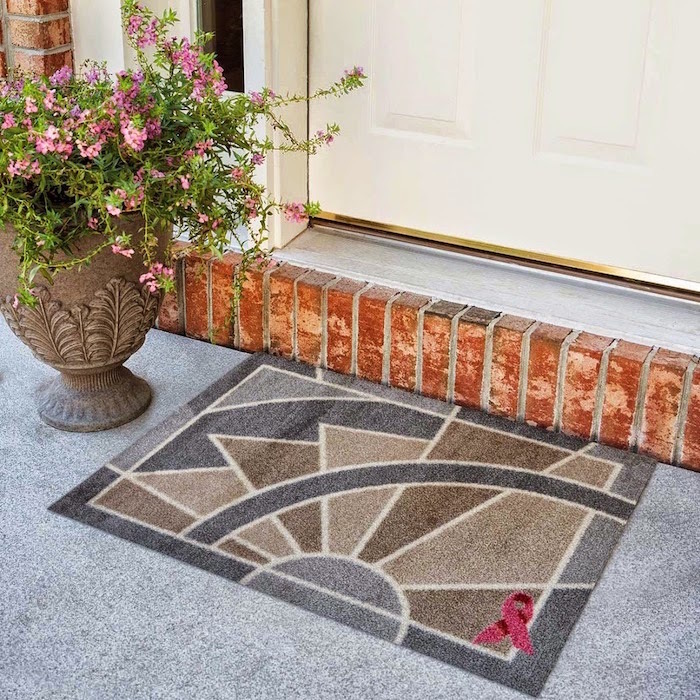 The welcome mats are available in 19 beautiful designs all year long in Carpet One Floor and Home stores throughout the U.S. for approximately $24.99 US/$34.99CDN. If you are in Canada or USA and would like to win a #WelcomeACure Designer mat of your choice before October 8th please leave a comment mentioning which design you like the most and follow my social media links to be eligible to win. Newfoundland canada. I love the sunny snowflake design! Thanks! I live in NW Ontario. I love the Penguins. Adorable! 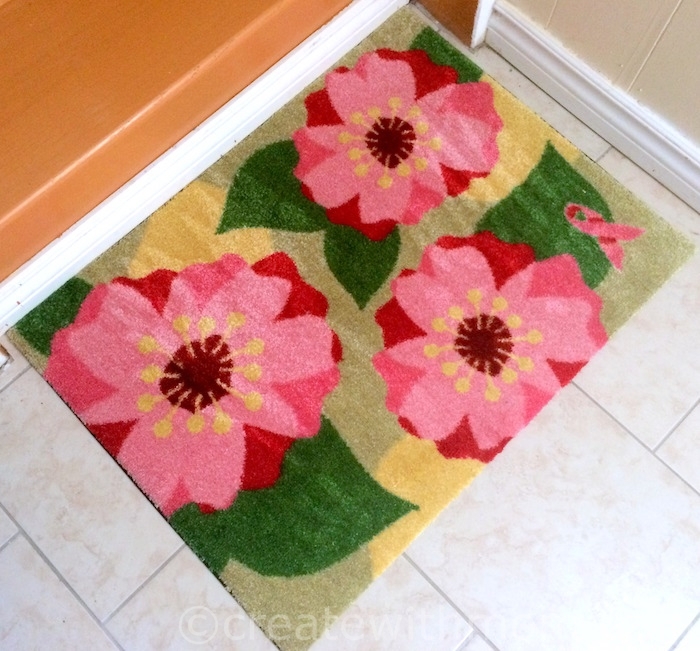 I live in Ontario and I like the Flower Power mat the most.It's just gorgeous. I live in Pembroke, Ontario. I live in ON, and I like the feather design! I live in Ontario and I like the Winter Wonderland Mat. Thank you. I'm from Ontario. I'd choose Patriotic Pizazz or Tropical Flamingo. I am in Ontario Canada and would like the Classically Celtic design. I live in Ontario and LOVE the Winter Wonderland mat. I am from BC. I love the Point me Home mat. I live in Alberta. I would pick For The Love of Penguins. So cute! I am in BC. I would pick the "light as a feather"
Ontario and would choose/like the Light as a Feather for my entrance. I live in Saskatchewan and I would choose the For The Love of Penguins. I'm from MB, & would love the Point Me Home pattern. I'm in Ontario and I love the pink flower one. I would love the light as a feather. I live in BC. I'd choose the Light as a Feather carpet. I live in NL. I'd like the Point me Home rug. I live in BC. I have three favourites: Light as a Feather, Flower Power and Pineapple Paradise. Winter Wonderland is also a favourite, but I do already have a Christmas mat that I like so I'd like to choose something totally different. I think overall I would choose the Pineapple Paradise - reminds me of Hawaii, where my husband and I got married. I live in Nova Scotia. I love the Light as a flower mat. Sorry I would choose light as a feather. Hmmmm, I can't make up my mind between Holiday Happiness, Flower Power and Classicly Celtic! Really nice door mats! I live in BC, Canada and I would pick For The Love of Penguins - it's cute! I live in Ontario and I would chose For the Love of Penguins. I live in Saskatchewan and would pick the Point Me Home; love this mat idea. I am in Ontario...I like the "Light as a Feather" print. I am in Ontario. I would like to win the For the Love of Penguins mat. I live in Ontario and I would love the Paws Here welcome mat. I live in Port Coquitlam, BC. I would love the flower power, Whalecome Home, or the Tropical Flamingo, I think I would have to let DD choose. 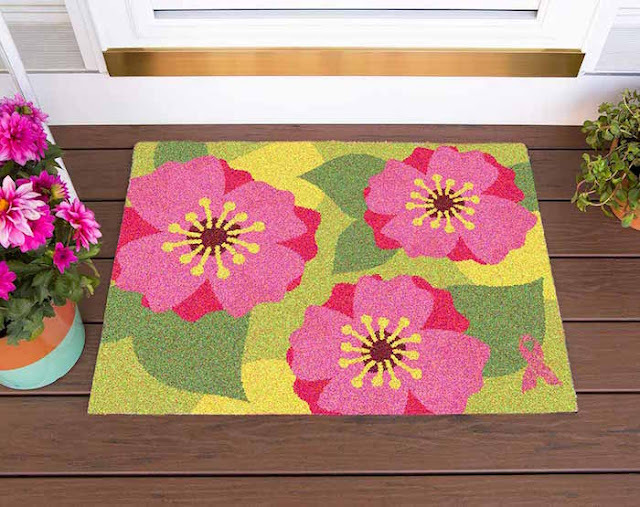 I live in Port Hope Ontario, I would choose the Flower Power mat. I live in Canada and would love Flower Poer. I live in Manitoba and would love Flower Power. I live in Newfoundland ad the design i would like is the Light as a feather! Ontario. I like the Classically Celtic mat. It would match well with my decor. The pineapple mat looks fun too though, tough call. I'm from Ontario. It's winter 10 months of the year where I live, so I'd like to get the Winter Wonderland first. They're all cute. Perhaps one for every season. I'm in Ontario! and I really like the Starry night design! I live in Toronto, Ontario and LOVE the Whale mat! 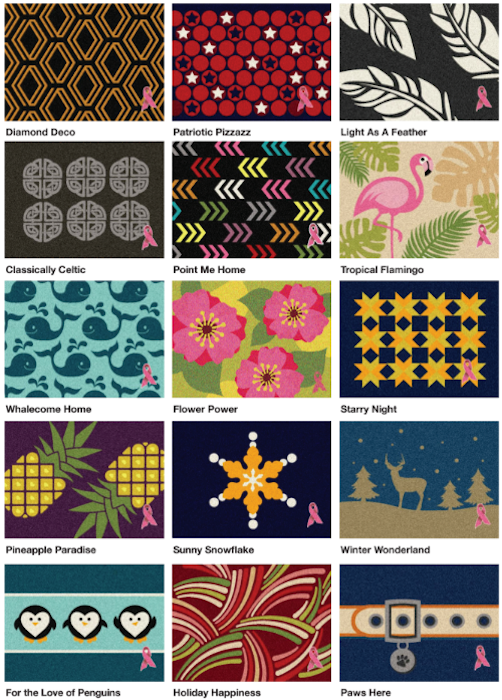 i'm from Ontario and I would choose the pineapple paradise print!! I live in BC and like Point Me Home! I live in Nova Scotia. I like the Light as a Feather design best. I live in Ontario Canada and I really like the Diamond Deco!! I'm in Alberta. I like the "Holiday Happiness" mat.